This year has started off surprisingly and pleasantly well for Super Woman Productions and Publishing. I have been pleased to include three phenomenal women to the Super Team in different capacities. I’m in the middle of an interview frenzy for interns to fill positions within the company that are structured for long-term opportunities. The FabLife Radio Show is showing consistent listeners each week with some significant growth as well. On March 8, 2013 we’re celebrating International Women’s Day and we have celebrity guests that are going to be on the show. We’re preparing for the launch of FabLife Apparel and Accessories this year and the fabulous ad campaign that will accompany it. I now also write a column for Thrive Detroit Street Newspaper which is sold at Source Books and D:Hive monthly. The February/March issue is available at both locations now for $1 per copy. In this the fifth year since the birth of my brain child, I can say that I am truly happy and that I have learned how to enjoy the small accomplishments just as much as the larger ones. Of course what I do isn’t easy (although I’m told I make it look like it is) and there are small challenges. But all of the challenges are a learning experience, as well as strength and character building exercises. Cultivating anything and doing it well, requires a lot of time, patience, persistence and work. People who blow up over night, are often forgotten about just as quickly. Where some people may feel that I’m not more “popular” because I have boundaries that I refuse to cross just for the sake of pleasing others, I’m perfectly comfortable with my current level of “popularity“. It allows me to maintain a life that I can enjoy without people being witness to my every move…for now. I have learned throughout this process (because that’s really what it is) that rejection and change are inevitable. I look at rejection as a necessary occurrence for people who I don’t need to exit stage left, so that the right people can be brought into my Super World. That often results in very positive change because the people who left had their own conflicting agendas. Anyone who tells me ‘no’ today, will one day beg to work with me. Not because I’m so much better than anyone else, but simply because everything that is taking place in my Super World is mapped out in the Master’s Plan. It’s going to happen regardless of what anyone else thinks, says or feels. So much of what I’ve achieved is not because of me; it is in spite of me. My accomplishments are in spite of me not having a degree. My accomplishments are in spite of me not having the understanding or acceptance of others (friends, family and peers). My accomplishments are in spite of me not being a reality TV star. My accomplishments are in spite of me not getting some of the opportunities I wanted to showcase my talents to others. Yet, I’m still here. I’m still growing. My business is still expanding. While others have yet to finish the same the projects that they told me ‘no’ to, I’m getting more projects of my own to work on. 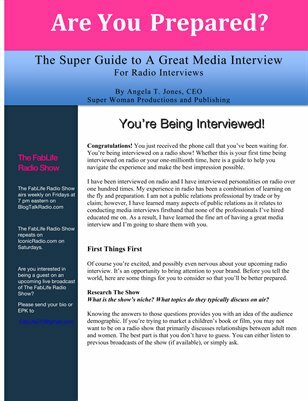 Daily new people all over the country (and in some corners of the world) organically discover Super Woman Productions and Publishing and are exposed to what I do. One of the biggest complaints I hear from people is how “others” are able to progress in society because they have money or opportunities given to them that people of color (particularly Black people) don’t have access to. I disagree with that. I believe that all progress is deeply rooted in the desire of the individual or group of people. Sometimes in order to experience progress, an individual must put distance between themselves and the group because the group isn’t growing or supporting the process. Progress is intentional. It is conscious. It is strategic. It comes from having a plan and working that plan. It comes from being diligent and looking for ways to improve. It’s not dependent on or hindered by anyone or anything else, unless you allow it to be. So in your new year look at what you want to do, and determine what you need to do better in order to get there instead of looking for excuses not to get there. It doesn’t matter how much time it takes. Improve your time management skills. Time is an investment that pays off well if used wisely.